I had called in on a whim to look through the outlet section with only a rough idea of what I wanted. I was pleased to find a pair of boots that were just right. 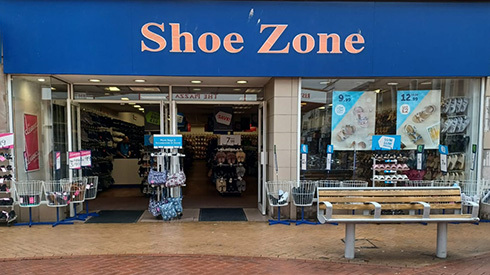 The store appeared to be divided up sensibly into various types of footwear and as far as I could see there were plenty of size options available. The cashier was very polite and let me know about my return options before completing the sale. I bought 2 pairs of trainers as ive started walking more and wanted a few pairs of shoes to reduce wear on the ones i have. I used 1 pair 3 times and the inner heel collapsed in and the inside fabric started peeling so i put the other pair and after only 1 hour of use the fabric inside those was peeling too. I took both pairs back to the store and the manager told me in a very short manner that the pair id used for only 1 hour wouldn't be exchanged as the peeling was due to "moisture" but she gave me a refund on the other pair with collapsed heels. Call me odd but when i buy shoes i expect them to last longer than an hour before showing wear and tear, i think in future i'll be looking for footwear elsewhere as i dont feel like you sell a good product and the customer service left a lot to be desired.